The flan recipe given here is my own adaptation from several recipes that I've used. The combination of cajeta, evaporated goat milk and whole goat milk give this flan a really smooth texture and just the right touch of sweetness. You can use commercially prepared cajeta, or homemade cajeta. Flan, also known as creme caramel, is a dessert that's recognized and enjoyed around the world. Feel free to experiment with different flavorings, such as almond, orange, maple or other. Just remember to keep it light — flan is a delicate dish, and you don't want the flavorings to overpower the basic taste of the custard. If you're just learning how to make flan, here are a few tips to help your first flan turn out great. Caramelizing the sugar will seem to take forever, but then it will begin browning quickly. Keep a close watch on it, as overbrowning will result in a bitter taste. Unmolding flan is a delicate procedure. Let it cool completely before trying to remove it. If you use a larger mold, such as I did in the pictures below, leave it in the refrigerator for a few hours first. And, if there is a large space from the top of the flan to the top of the mold, cut a base of cardstock or cardboard that will fit just inside the mold to help stabilize the flan as you ease it out. What about that rock-hard caramelized sugar in the pan and on utensils? Don't sweat it — a soaking in water will completely dissolve it within a short time. Caramel topping: Combine sugar and water in a small saucepan. Bring to a boil while stirring, until sugar has completely dissolved. Continue to boil without stirring, occasionally swirling the syrup, until it reaches an amber color. Remove from heat and pour into a pan mold or ramekins. Swirl the mold or ramekins so that the caramel partially coats the sides. 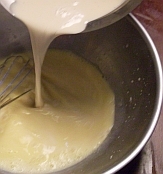 Flan: Place oven rack in middle position, and preheat oven to 350° F. Add the cajeta, evaporated milk, whole milk and vanilla bean or extract to a medium saucepan. Bring to a simmer while stirring. Gently pour or ladle the mixture into the mold or ramekins. Place these into a pan, without the sides touching, and add water to the pan until it reaches the level of the custard. Bake until the top is light brown. The time will vary according to the mold used. Ramekins may only take 30-40 minutes, while a larger mold may take an hour or slightly longer. The center of the custard will still be soft, but it will set as the custard cools. Cool at room temperature for 30 minutes to an hour. When using a larger mold, it's best to refrigerate for several hours to help the custard maintain its shape. Gently unmold the flan, garnish as desired and serve. Note: The recipe given makes two loaves like the one shown in the picture. Articles are updated frequently, so check back here for any new information related to goat milk flan recipes!